This Radiant diamond is 0.5 carat in weight, and comes with Excellent polish and Excellent symmetry, as verified from an independent gemological laboratory. The diamond is graded K in colour, and has a clarity grade of SI1. The diamond's GIA grading report number is 6322389906, which will detail further its specifications and measurements, and will also come with the purchase of the stone. AUD 16,037 Excl. Duties / Taxes. This Radiant diamond is 2.52 carat in weight, and comes with Excellent polish and Very Good symmetry, as verified from an independent gemological laboratory. The diamond is graded K in colour, and has a clarity grade of SI2. The diamond's GIA grading report number is 2176965829, which will detail further its specifications and measurements, and will also come with the purchase of the stone. This Radiant diamond is 0.91 carat in weight, and comes with Excellent polish and Excellent symmetry, as verified from an independent gemological laboratory. The diamond is graded K in colour, and has a clarity grade of SI1. The diamond's GIA grading report number is 5303193749, which will detail further its specifications and measurements, and will also come with the purchase of the stone. AUD 60,118 Excl. Duties / Taxes. This Radiant diamond is 5.02 carat in weight, and comes with Excellent polish and Very Good symmetry, as verified from an independent gemological laboratory. The diamond is graded K in colour, and has a clarity grade of VS2. The diamond's GIA grading report number is 5131845449, which will detail further its specifications and measurements, and will also come with the purchase of the stone. AUD 80,455 Excl. Duties / Taxes. This Radiant diamond is 5.56 carat in weight, and comes with Very Good polish and Good symmetry, as verified from an independent gemological laboratory. The diamond is graded K in colour, and has a clarity grade of VS1. The diamond's GIA grading report number is 1186067301, which will detail further its specifications and measurements, and will also come with the purchase of the stone. AUD 3,500 Excl. Duties / Taxes. This Radiant diamond is 1.02 carat in weight, and comes with Very Good polish and Good symmetry, as verified from an independent gemological laboratory. The diamond is graded K in colour, and has a clarity grade of SI1. The diamond's GIA grading report number is 1275456707, which will detail further its specifications and measurements, and will also come with the purchase of the stone. AUD 23,195 Excl. Duties / Taxes. This Radiant diamond is 3.02 carat in weight, and comes with Very Good polish and Good symmetry, as verified from an independent gemological laboratory. The diamond is graded K in colour, and has a clarity grade of SI1. The diamond's GIA grading report number is 6271708417, which will detail further its specifications and measurements, and will also come with the purchase of the stone. This Radiant diamond is 1.01 carat in weight, and comes with Very Good polish and Very Good symmetry, as verified from an independent gemological laboratory. The diamond is graded K in colour, and has a clarity grade of VS1. The diamond's IGI grading report number is 332876787, which will detail further its specifications and measurements, and will also come with the purchase of the stone. This Radiant diamond is 2 carat in weight, and comes with Very Good polish and Very Good symmetry, as verified from an independent gemological laboratory. The diamond is graded K in colour, and has a clarity grade of VS2. The diamond's GIA grading report number is 2195667852, which will detail further its specifications and measurements, and will also come with the purchase of the stone. AUD 3,503 Excl. Duties / Taxes. This Radiant diamond is 1.02 carat in weight, and comes with Excellent polish and Excellent symmetry, as verified from an independent gemological laboratory. The diamond is graded K in colour, and has a clarity grade of VS2. The diamond's GIA grading report number is 1319573882, which will detail further its specifications and measurements, and will also come with the purchase of the stone. AUD 10,424 Excl. Duties / Taxes. This Radiant diamond is 2.01 carat in weight, and comes with Excellent polish and Excellent symmetry, as verified from an independent gemological laboratory. The diamond is graded K in colour, and has a clarity grade of SI1. The diamond's GIA grading report number is 6282226113, which will detail further its specifications and measurements, and will also come with the purchase of the stone. AUD 11,711 Excl. Duties / Taxes. This Radiant diamond is 2.01 carat in weight, and comes with Excellent polish and Very Good symmetry, as verified from an independent gemological laboratory. The diamond is graded K in colour, and has a clarity grade of SI2. The diamond's GIA grading report number is 2185007095, which will detail further its specifications and measurements, and will also come with the purchase of the stone. This Radiant diamond is 1.52 carat in weight, and comes with Very Good polish and Good symmetry, as verified from an independent gemological laboratory. The diamond is graded K in colour, and has a clarity grade of SI2. The diamond's GIA grading report number is 5201041351, which will detail further its specifications and measurements, and will also come with the purchase of the stone. This Radiant diamond is 1.21 carat in weight, and comes with Good polish and Good symmetry, as verified from an independent gemological laboratory. The diamond is graded K in colour, and has a clarity grade of VS2. The diamond's GIA grading report number is 5151437515, which will detail further its specifications and measurements, and will also come with the purchase of the stone. AUD 3,599 Excl. Duties / Taxes. This Radiant diamond is 1.02 carat in weight, and comes with Excellent polish and Good symmetry, as verified from an independent gemological laboratory. The diamond is graded K in colour, and has a clarity grade of VS2. The diamond's GIA grading report number is 2155410154, which will detail further its specifications and measurements, and will also come with the purchase of the stone. This Radiant diamond is 1.02 carat in weight, and comes with Very Good polish and Good symmetry, as verified from an independent gemological laboratory. The diamond is graded K in colour, and has a clarity grade of VS2. The diamond's GIA grading report number is 1156090321, which will detail further its specifications and measurements, and will also come with the purchase of the stone. AUD 29,740 Excl. Duties / Taxes. This Radiant diamond is 3.03 carat in weight, and comes with Excellent polish and Very Good symmetry, as verified from an independent gemological laboratory. 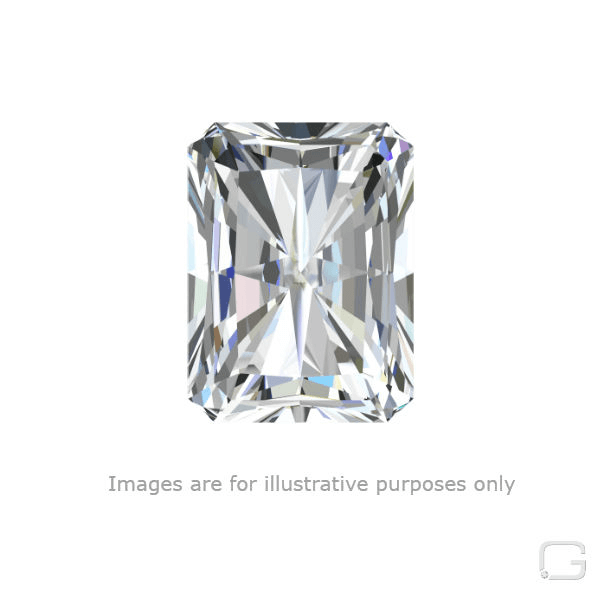 The diamond is graded K in colour, and has a clarity grade of VVS2. The diamond's GIA grading report number is 2185884086, which will detail further its specifications and measurements, and will also come with the purchase of the stone. AUD 26,208 Excl. Duties / Taxes. This Radiant diamond is 3.28 carat in weight, and comes with Excellent polish and Good symmetry, as verified from an independent gemological laboratory. The diamond is graded K in colour, and has a clarity grade of SI1. The diamond's GIA grading report number is 5172560753, which will detail further its specifications and measurements, and will also come with the purchase of the stone.